Heroes save lives. Voluntary unpaid blood donors are unsung heroes whose gifts of blood save lives every day. Recognizing the contribution of our heroes is the theme of World Blood Donor Day 2012, observed on 14th of June. 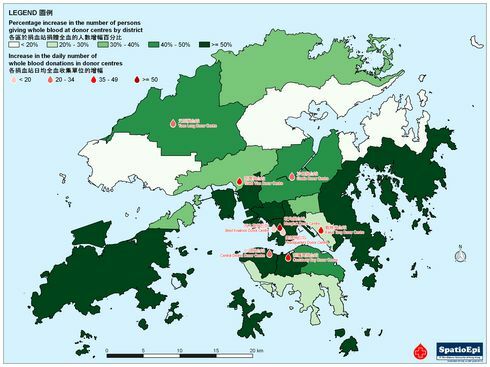 This map shows the distribution of Hong Kong‘s heroes in our neighbourhood. 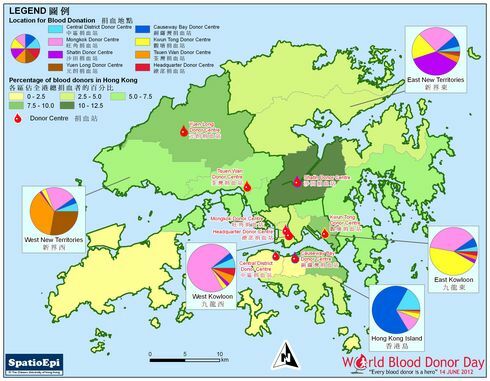 As indicated by blood symbols, there are eight donor centres providing blood donation services in different parts of Hong Kong. The pie charts show that donors tend to donate blood in centres located within their region of residence. For example, over three quarters of blood donors living on Hong Kong Island chose to donate blood in Causeway Bay Donor Centre or Central District Donor Centre. As depicted by graduated colours, Shatin District has the largest pool of blood donors in Hong Kong. Data for the map were obtained from a survey conducted in 2012 by Stanley Ho Centre for Emerging Infectious Diseases, the Chinese University of Hong Kong in collaboration with Hong Kong Red Cross Blood Transfusion Service.